next time something like this happens \'every week\' then bunch of guys should actually do this..
\n2. a girl member should \'faint\' seeing this..
\nrepeat it a few time with more innovative and different ideas!! That way you will give company management real practical trg in dealing with real emergencies during fire drill!! \n5. straightaway head for parking lot..take out your vehicle and head home...tell the guys that you love your car and in no-way you would have left it at mercy of fire-fighters ! \nOne intelligent chap was talking on the phone in the corridor in our dept. While talking he just pulled the fire alarm switch without realizing. Our building was old and so fire alarms were not enclosed in glass or plastic casing. Anyways back to story, the alarm went off and one old secretary in our dept got so shocked that she had a cardiac arrest and died on the way to hospital. Now our Mr. Smart Pants had some blue ink sprayed on his hands, proof that it was he who pulled the switch. Cops got hold of him and he had to do like 200 hours of community service. Lesson learnt big time. \r\n2. a girl member should \'faint\' seeing this..
\r\nrepeat it a few time with more innovative and different ideas!! That way you will give company management real practical trg in dealing with real emergencies during fire drill!! \r\n5. straightaway head for parking lot..take out your vehicle and head home...tell the guys that you love your car and in no-way you would have left it at mercy of fire-fighters ! \r\nLooks like you got plenty of time today. Shaane...yeh sab karke dikhaanaa kabhi. \r\nLene ke den pad jaayenge. Looks like you got plenty of time today. Shaane...yeh sab karke dikhaanaa kabhi. \nLene ke den pad jaayenge. \r\n How about your workplaces respectively? \r\nYes you can run once out, but you have to be very careful how you run and where you run because the emergency vehicles will be coming in at full speed. You dont want to be in their path. \r\nAlso we were told to not go and try to get out in our cars because it might so happen that in a rush to get out all the cars would block the emergency vehicles and hamper their speed to enter and be close to the building. Also, this would be considered a offence of obstructing emergency vehicles. .not blood-hungry like a few people in this word are. You very well know whom am i talking about. \r\n	I am here because I am nowhere else. But, am I there where I wanted to be? Fidel has been asking for wrath since 2001 . kahan hai wrath is it some chidiya or some jaanwar . how will it look like ? Sorry to disappoint you Viky.. but I can\'t offer you what you want.... .. I am straight... may be you can ask Aurangzeb..
\n ... Whatever it was I can\'t give it to you... I can\'t make you an offer you can\'t refuse.. I know you are lame . But I said go see a horse not the baba. You need some horse consultancy. be right back... reserving this space for later... kaam hai baba! Oh so you are indeed going to see the horse No problem clean the stables after your appontment with Dr. Horsey, that\'s a lot of work! Baba ke saath kaam hai? My god! The truth finally came to light! Why do you want someone to watch while you are doing your \'kaam\' with the kaamuttejak baba? Okay, where were we? Oh yes, fire drills... now where are we?? CHalo baba, bahut derail ho gaya. haan viking aur get chitra pai ke beech ka pyaar panap raha hai .. In india we have these fire drills as well, and for me and many in office it is timepass time. As sprite said in the first page of this thread...there are few folks in office who imitate as if they are more worried about work than the fire alarm. They dont come out untill the security guard shouts at them. They are fun to watch, and their acting skills are remarkable. \nFirst thing i do after i hear alarm is press (CTRL + ALT + DEL) lock the computer. Girls and women folk are terrible during these excersizes, they walk very slow and that creates huge crowd and jams near stair case. I dont know wether they will walk like this even if it is a real fire. \nAfter assembling down, there is another tamasha. The building incharge or the HR executive responsible gives a speach saying how quickly and wonderfully the people in building have responded for the alarm. While he/she speaks...people are still getting down the building. \nAnd the best part is, nobody goes back to workplace after getting down. Everyone goes out of building to a nearby chai ki dukan to have a smoke or tea and take a long break. Many do not even understand the seriousness of these drills. In case of real fire, if they do not pay close attention in these drills, the same negligence could cost a life. \nI agree with you when you say women walk very slowly during these drills as if they are in a park. 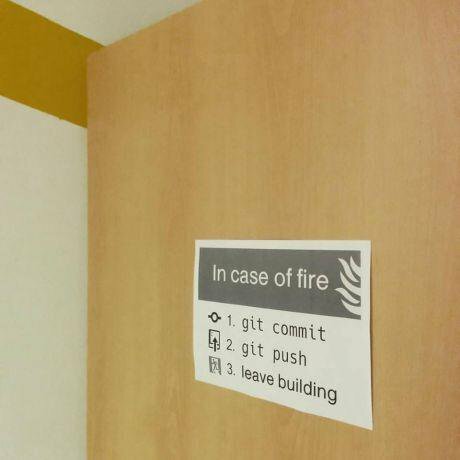 In case of real fire, they are the first ones to cause stampede. First thing i do after i hear alarm is press (CTRL + ALT + DEL) lock the computer. You can also go Windows button + L to lock computer... its faster. \ncoming back to topic... I have never seen an email about fire drills explaining code of behavior expected from people. They should state how everybody must lock computer and leave their seats calmly. \r\ncoming back to topic... I have never seen an email about fire drills explaining code of behavior expected from people. They should state how everybody must lock computer and leave their seats calmly. \r\nThis is serious. Talk to your boss or HR. Someone can get in serious trouble for this. never been in a fire-drill but every month end they do a fire test and that sound is so annoying .